This Post Would Get Me Arrested in China. 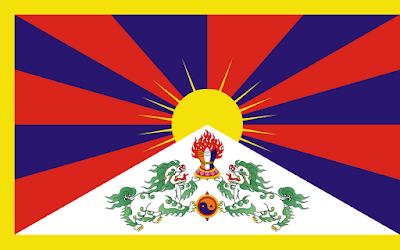 Fortunately I don't live in China, or in the occupied nation of Tibet, or I'd be in jail like Tsering Dondrub just for pasting this image of the Tibetan flag here on my blog. On Tuesday night Jon was shoot-milk-out-your-nose-because-you're-laughing-so-explosively funny when Fuckface von Clownstick joined the Presidential race, but on Thursday night he gave us this, the most succinct and truthful statement about the Charleston racial terrorism of the night before, and our predictable and insufficient response to it. I'm going to miss him and I no longer even get Comedy Central on my television; I just watch (and share) these clips. What transpired in Charleston, South Carolina last night was not just a tragedy, it was an act of terror. Nine of our fellow Americans were murdered while praying in a historic church because of the color of their skin. This senseless violence fills me with outrage, disgust, and a deep, deep sadness. This hateful killing is a horrific reminder that, while we have made important progress in civil rights for all of our people, we are far from eradicating racism. The Emanuel African Methodist Episcopal Church is one that has been attacked, burned, and rebuilt throughout its 200 year history. While their community mourns now, they will rebuild, and they will emerge stronger than before. Our thoughts and prayers are with the families and their congregation. But we can add our actions to our prayers. The families and the community that have been hurt so very badly by this brutality need our help. Let us stand with them in their time of mourning. You can help by making a donation to the Emanuel AME Church community today. Clementa C. Pinckney, Pastor of Mother Emanuel A.M.E. I'm trying to watch this at work with headphones and I can't view more than 20 consecutive seconds of video without disturbing my neighbors with stifled laughter. Can't Jon stay at The Daily Show at least until the 2016 GOP Clown Circus finally folds its tent, or at minimum until the candidate known as Fuckface von Clownstick drops out? I've asked this before about Paul Ryan and RATM and Chris Christie and Springsteen, but don't Republicans realize that songs have lyrics? In the middle of this morning's meandering speech at Trump Tower, Donald Trump finished the sentence "I am officially running for President of the United States and we are going to make our country great again" and immediately looked up toward someone in the ceiling and gestured for music. The recognizable guitar riff from Neil Young's "Rockin' in the Free World" played for a few seconds before the Donald went back to scapegoating Mexico, Mexicans, and Obamacare. Does he know the song has words other than those in the chorus? These kinds of misunderstandings have a long GOP history going back at least as far as Reagan praising Springsteen's "Born in the USA," but maybe Trump really is as smart as he thinks he is; maybe he is using Neil's lyrics to indirectly attack yesterday's new candidate, Jeb!, by going after his father's kinder and gentler thousand points of light? UPDATE @ 8pm EDT: Not only has Neil Young's manager Elliot Roberts confirmed that The Donald didn't have permission to misuse Neil's anthem this morning, but that Neil Young has endorsed the anti-Trump, Bernie Sanders. 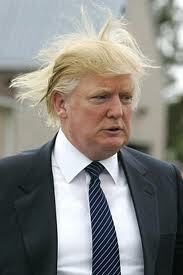 Who says Donald Trump has no experience? Just in case you forgot (I did), the ultimate Reform Party candidate in 2000 was Pat Buchanan (how could I forget the votes he got in Palm Beach County because of a bad ballot design that threw the state of Florida and the presidency to George W. Bush?). 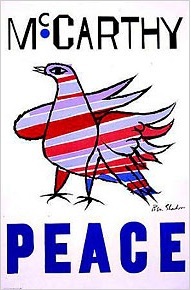 More than a "Protest Vote"
Ben Shahn's classic McCarthy poster. The following quotation appeared yesterday in a New York Times piece from Patrick Healy, "Bernie Sanders Can Take Heart From a Broadway Champ." A look at the Schoen Consulting website shows that Douglas Schoen has worked for US politicians, including both Clintons, Mike Bloomberg, Jon Corzine, and Evan Bayh; US corporations, including Walmart, P&G, and AT&T; and international politicians Tony Blair, Silvio Berlusconi, and three Israeli Prime Ministers. In other words, he's as Establishment as they come and his thoughts are representative of the "common knowledge" and "conventional wisdom" of the power elites. He's also wrong. If you look at the support Eugene McCarthy got in 1968, he was far from being a fringe figure or a mere "protest vote." Peace-candidate McCarthy was not expected to do well against Lyndon Johnson in the first primary in New Hampshire, but his strong 42% second-place showing against the sitting President was at least one of the factors that led to LBJ's withdrawal (and RFK's entry into the race). McCarthy won the most popular votes in the 1968 primaries, but it was a time when party machines were able to give the nomination to the candidate who had received the fewest votes, LBJ's VP Hubert Humphrey, who had concentrated on the wheelers and dealers in non-primary states rather than attracting primary voters. There was a reason there was chaos in the streets outside the Democratic convention. "...you learn really how strong the Establishment is, not just the political Establishment, but the business Establishment...the business community and the political institutions are all geared to the Establishment, and when they're really tested they're all militarist..."
I felt I needed to capitalize "Establishment" when transcribing the quote pulled from the video, because that's the way we thought of that word at the time. It's a word that would serve the Bernie 2016 campaign well (I'm sure it's a word Bernie Sanders used very freely in his political past). I had the pleasure of seeing a new production of Molière's Tartuffe at the Shakespeare Theatre Company in D.C. last Saturday night. While standing in the lobby with my wine during intermission, I was surprised to see a badly-dressed man wearing William Kristol's familiar permanent frown walk past. A couple of days later, something made me search for "Bill Kristol Tartuffe" on Google and I was led to his tweet about the show. Just fled at intermission from ghastly production of Tartuffe @ShakespeareinDC. Perhaps worst single production of any play I've ever seen. The Saturday performance was a preview that received a standing ovation from those of us who stayed until the end, but it hadn't been reviewed yet. When the play officially opened on Tuesday, it received unanimous rave reviews in all the places I could find: The Washington Post, DC Theatre Scene, Broadway World, and DC Metro Theater Arts, but, then again, all of these reviewers seem to have watched the end of the play rather than storming out like an offended French noble watching the first version in 1664 (before the royally-mandated happy ending in the 1669 version). Of course, Bill Kristol has been known to make extremely hasty and seriously erroneous judgments before. Here he is on C-Span in 2003 mansplaining to Daniel Ellsberg how George Bush's decade-long war in Iraq would be nothing at all like Vietnam. This news hurts this morning. Here is Ornette in 2008 playing 'Lonely Woman' from 1959's The Shape of Jazz to Come. Here's Ben Ratliff's New York Times review of the one time I was lucky enough to see him play at Carnegie Hall in 2006. And here's the late Charlie Haden talking to Amy Goodman on Democracy Now! about being present at the revolution in the 1950s. The last time I voted in a primary that mattered was 2008 when I was living in New Jersey and did not need to enroll in a party to vote for Barack Obama. 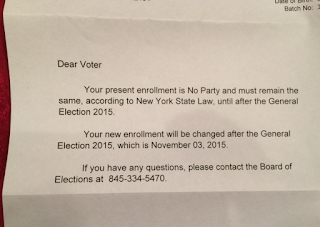 However, since moving to New York and registering as "No Party" in 2010, I have not been able to vote in a New York primary election. That didn't matter in 2012, but when Vermont's independent Senator Bernie Sanders announced his candidacy for the Democratic nomination, I decided it was time for me to make the same change. 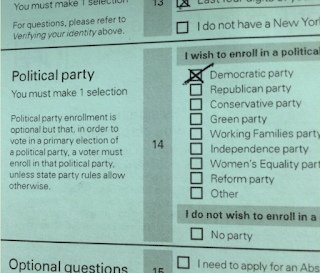 I went to the New York State Board of Elections website to get the proper form to convert my independence into Democratic Party membership, and on May 26th I mailed the form to my county board of elections. Yesterday, June 4th, I got home to find the following letter in the box at the end of my driveway. 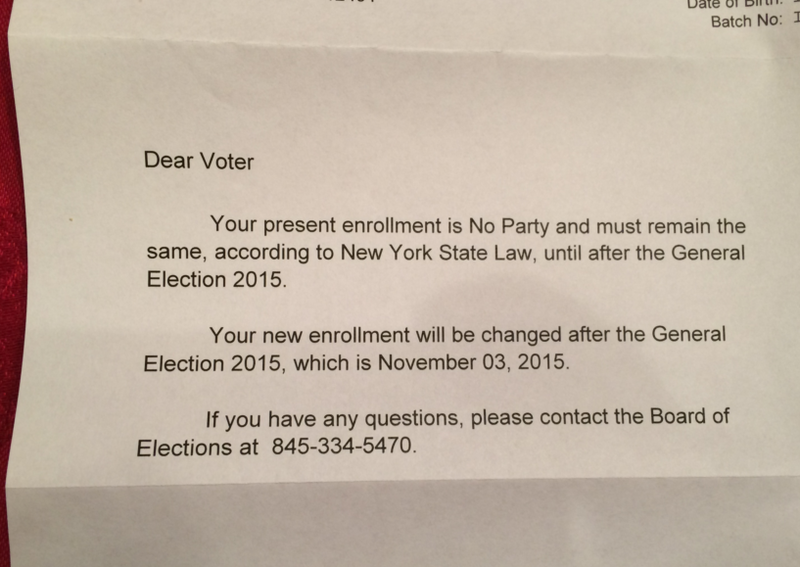 Your present enrollment is No Party and must remain the same, according to New York State Law, until after the General Election 2015. Your new enrollment will be changed after the General Election 2015, which is November 03, 2015. 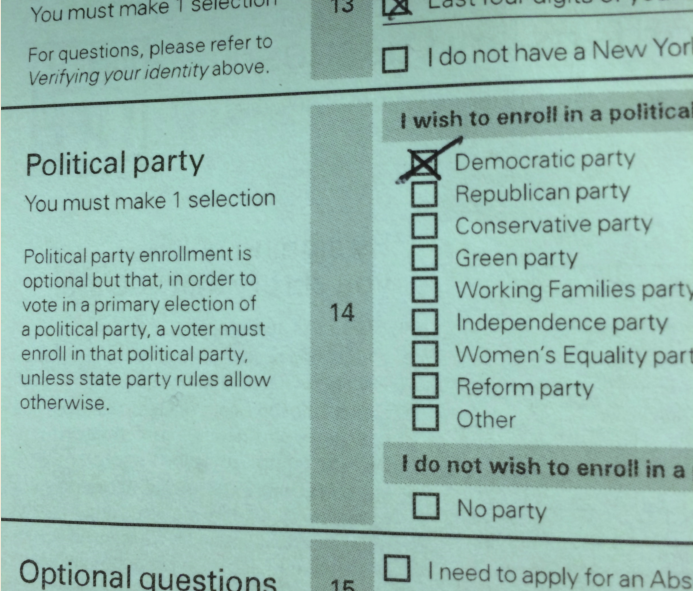 So, if you are a potential Bernie Sanders supporter in New York or another state like New York with closed primaries and rules written to favor official party candidates, then please check your voting status as soon as possible. UPDATE 6/14/2015: Click here for a great link from voteforbernie.org on voting rules in other states. Telephone polls will keep reporting results for as long as there are telephone poles and for as long as there are lazy and competitive news outlets looking for ways to draw curious eyeballs to their advertisements. 1) This morning I saw this Time headline online, "Johnny Carson Reigns as America’s Favorite Late-Night Host, Poll Finds," which seemed a little strange since he's been off the air for 23 years and a large percentage of the adult population able to stay up past 11:30 at night has never seen Johnny host The Tonight Show. Yet he had almost twice as much support as his closest competitors, 'None' and David Letterman. As suspected, this was a telephone poll of 2,105 Americans conducted by Quinnipiac and the only fact it proved is that the only people who are regularly answering calls from unidentified numbers are people over 65. I'm only surprised Jack Paar and Steve Allen didn't beat Letterman too. 2) The clincher came later in the morning when I read this AFP headline: "George W. Bush More Popular than Obama: Poll." This CNN/ORC poll was conducted by telephone from May 29 to 31 on a representative sample of 1,025 Americans who were dumb or old enough to answer calls from strangers. The pollsters claim a margin of error of 3%, which makes Dubya's 52%-49% "victory" over Obama a tie, but I'm leaning toward a margin of error of infinity. Not only have telephone polls lost their utility and credibility; they've even lost what little ability they had to divert attention from cat videos.